The orders are aimed at expediting oil and gas pipeline approvals, including asking the Environmental Protection Agency to update guidance regarding state permitting authority under the Clean Water Act. The goal here is to keep some states, like New York and Washington, from using the Clean Water Act permitting to kill major energy projects. Trump specifically called out New York’s blocking of the Constitution natural gas pipeline. New York and the Constitution Pipeline’s developers have been locked in a legal battle for the last three years after the state denied the project a Clean Water Act permit. The pipeline will bring natural gas from producers in Pennsylvania to upstate New York and is supported by labor unions. 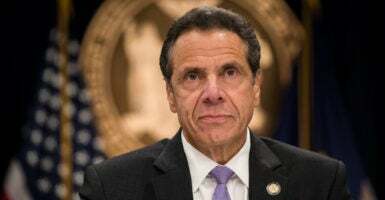 Cuomo’s administration denied permits for Constitution and other pipelines on environmental grounds, and instead is using his own version of the Green New Deal to get 100% carbon-free electricity by 2040. Trump is looking to set stricter timelines and narrow the scope of review states can use to evaluate pipelines and other projects that need Clean Water Act permits. For example, New York rejected the Constitution Pipeline 360 days into its review. New York rejected a Clean Water Act permit for the Valley Lateral pipeline in 2017 over the impacts it could have on climate change, which has nothing to do with water quality. Trump’s order could prevent states from using such an expansive standard for review.